tl;dr Go to http://cleanup.thepcspy.com and start cleaning! It only took a year but it's finally here: It's clean up time! But let's step back a bit... What on earth am I talking about? Until now it's been slightly painful to get a good grip on what questions need answering. It's also a job that goes without recognition. These are two things we wanted to change so I set about building something that uses the StackExchange API to find and allocate people questions. Today that something is going live and everybody and anybody can join this targeted clean up effort. You'll see how it all works when you get there but essentially, per the plans, you get "Clean Up points" for cleaning up. These are completely separate from your reputation. Assuming everything goes to plan we'll then hold a competition-based Clean Up Week to see who can clean the most in 7 days. We're just working out what we're going to do for prizes. How can I log in? What is my OpenID? If you don't have a regular OpenID with another provider, you can use Stack Exchange's provider by entering the URL: https://openid.stackexchange.com/. I've just cleaned something up but it's still in my queue... What's going on? The queues update every 20 minutes and there's 5-minute caching on the pages so in the worst case scenario you could be waiting for 25 minutes for something to disappear. In most cases, you'll be waiting less time than this. It's been hours and it's still on my list! What gives? Might be a bug. I've certainly turned up a few of them during this process so just let me know via an answer on this thread and I'll try to see what's going on and fix it. It is not clear how this works. I registered on http://cleanup.thepcspy.com , was assigned 10 questions. How to troubleshoot apt-get connection problems? I marked it as a duplicate and I gave it an up vote as the answer was a good one with some nice screen shots. The question still shows up on my 10 assigned questions and I do not have the ability to take some of the actions listed. Specifically I can not alone close the question, I can not merge duplicates. It seems there are some actions on your list that are simply not options for me. EDIT- OK, it took longer then expected, but the question is now off my assigned questions, but it still seems there are actions you suggest that I can not take. 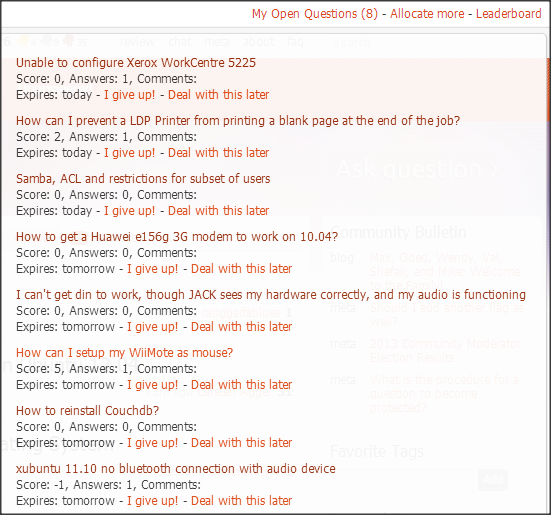 How do I "Removing or improving the unanswerable - Ask Ubuntu is only as good as its questions. We will need people to chase up old threads to make sure they have enough information to be answered. If their users don't respond and edit their posts, we need to cull the deadwood." I found a question that appears to be abandoned in that the OP has not provided the necessary information. Do I flag it as abandoned ? Similar, How does one "merge duplicates"? Observations / feedback on http://cleanup.thepcspy.com/info/ after spending some time with cleanup. Team work and answers to questions is to be encouraged !!! Clear definitions of abandoned questions. Older than __ months , OP not seen in __ months and or not responded to requests for additional information after 3 days (3 days is the expiration you set on allocated questions). Not a bug report, no clear answer to a problem, inactivity. I think this needs to be defined as tight as possible for the cleanup process, guidelines can be relaxed after the cleanup. Bug reports should be triaged and closed if they are inactive, but IMO leave them open if it seems to affect a sufficient # of people to stimulate a productive discussion on askubuntu.com. IMO bug reports should be encouraged and, Ideally, experienced users should mentor new users (new meaning new to LP or new to bug reports). Perhaps award a point for Question -> new bug report ? Ask for community support for closure. This is the team work part, but it seems as if closure requests are inactive. I think closure should be primarily a community decision. Define how active (or inactive) the moderators should be with closure. My suggestion is for clear guidelines for how many flags / posts on Ubuntu Regulators chatroom are appropriate per user per day (otherwise the moderators are going to be swamped with closure requests and the community effort is circumvented). My suggestion would be to limit users to no more then 5 flags / posts on the Ubuntu Regulators chatroom per day. Perhaps ask the moderators to limit their activity to 5 closures / day. Sort of depends on if your preference is to make a concerted effort at closure, and if so you should increase the flags / close votes users have per day and encourage posts on Ubuntu Regulators chatroom or answers, in which case you should encourage answers / bounties and limit close requests by moderators. Encourage setting bounties for good questions. Perhaps 1 point for offering a bounty for good questions. The guy has 6 rep points ( 1 for signing up, 5 for an up vote to this one question ), logged in only once to ask this question and not logged in since. He has two comments asking for more information and not done so. I plan to flag this as too localised, not enough people uninstall unity to make this a valuable question. I will use my own initiative in future but I just want some feedback to see if this is the right approach. This is not really an answer, but a question, but... keeping all info in the same place will be a great idea, and this is going to be too long for a comment. Feel free to edit the question with this info and delete this "answer". What should we do with those questions?. I have a good candidate, this. It's impossible to answer as the original asker didn't give any of the data that was requested. I can either flag it to the moderators for deletion, vote to close as too localized, or both. How should we proceed with this kind of questions?. Can this system be gamed by moderators? As far as I understand the workings of the site when moderators vote for closing their vote is a final ruling compared to normal users who either have to flag for closing (and the flag is handled by a moderator) or vote to close (it takes five normal votes to close). Thus, moderators have an upper hand in scoring cleaning points for closing questions. Their votes do not rely on any other users participation since it is final. I am not saying that moderator would game the system by unjustified closing but there might be an interest in build the system against such use if possible. Is it possible to build the system such that it counter bad usage such as the described possibility? Maybe there are such counter measures implemented already? One way to make the system more fair is to give moderators slightly less cleaning points for anything involving closing. This would reflect that the effort for closing a question is greater for a normal user than for a moderator. I am not trying to be pessimistic. I appreciate the effort of putting this together. I just want to see it as good and fair as possible. The question is semi-answered in the comments or the OP found an answer. In some I posted a comment asking the OP to post the solution, in others I have marked them as "close" as "too localized". Would you prefer I transcribe the answer ? If so, does it then need an upvote from someone else ? That hardly seems fair as I would be getting credit for the work of others. The OP has not been seen since asking the question, question has had no activity, but both the community and moderators seem reluctant to close the question. Personally, I have been simply moving on if I do not know the answer and can not find a duplicate. 1) This situation seems to frustrate some people who take part in the clean up effort. They want to flag it to be closed , and no action is taken. 2) It seems likely this sort of question will continue to linger. 3) There are only so many bounties I can offer, I am limited to 3, and currently have 3 open. I have seen questions which already have an Accepted Answer (but with 0 score) also appear in our Allocations. Is this intended? Some of the questions disappear from Open Allocation list if one of the answer gets 1 vote - AFAIK 2 votes are required for a question to be considered as Answered. Has there been a change in policy? Recently, a question was allocated to me which had already been closed on Jan 1st. Don't remember the question or its link. Would update if I come across another such allocation. How can I prevent a LDP Printer from printing a blank page at the end of the job? Queston 1: Why is this not built natively into AU as a necessary part of creating the encyclopaedic canon of Ubuntu Questions and Answers? Let's reduce the burden on cleaning activity and put this directly in AU. Everyone should be asked to do this when showing up to AU. Question 2: Why are organizing, de-duping, revising, and other cleaning duties not worth real Reputation Points? Let's increase the benefits of cleaning activity and reward it. Cleanup activity would increase dramatically if the same incentives were used for this behavior as for all other AU behavior.